On the left you can see the yellow/greenish cast that is common today with cool white fluorescent lights. After exposure to this type of light, this yellow/greenish cast becomes the faux norm. Hence, this situation makes it easy to overlook. On the right is CRS Light's full spectrum lights. We have been making these bulbs for forty years. They are the industries closest to that of Natural light at the best price, with the biggest variety of sizes. If you need large volume pricing, please call 1-888-572-3899. 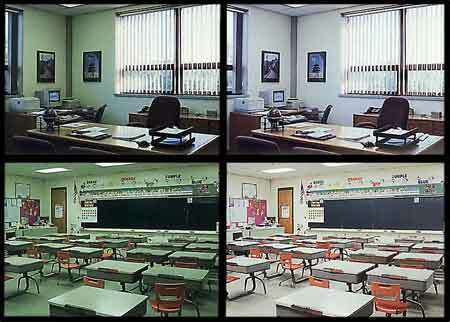 Traditional “cool white” lighting in most schools emits a contrast diminishing, yellow/greenish cast. CRS Light’s Natural Light color temperature instantly transforms the visual appearance and offers the many benefits of natural light. Everyone wins. The teachers have less eyestrain and red in the eyes, which makes their day a little easier. The students have increased concentration levels and are less agitated with the long day. The room colors are much cheerier. (a recent testimonial from a school).